-Sleep apnea is a common sleep disorder characterized by repeated interruptions in breathing throughout the sleep cycle.These interruptions, called apneas, are caused by the collapse of soft tissue in the airway, which prevents oxygen from reaching the lungs.Weak muscles in the airway, a large tongue, obesity, and other factors may cause airway tissue to collapse and obstruct breathing.Sleep apnea disrupts the sleep cycle and can dramatically impact energy,mental performance, and long term health. In some cases, if left untreated, sleep apnea can be fatal. -Sleep apnea affects 5-10% of adults in the United States, though a majority of sufferers go undiagnosed.Potentially dangerous symptoms, such as snoring , are often overlooked. -Excess weight: An adult with a BMI of 25 or higher is considered to be overweight. Your risk of sleep apnea increases with the amount of excess body weight. Is sleep apnea a disease? Sleep apnea (AP-ne-ah) is a common disorder in which you have one or more pauses in breathing or shallow breaths while you sleep. Breathing pauses can last from a few seconds to minutes. They may occur 30 times or more an hour. Typically, normal breathing then starts again, sometimes with a loud snort or choking sound. Sleep apnea is a serious sleep disorder that occurs when a person's breathing is interrupted during sleep. People with untreated sleep apnea stop breathing repeatedly during their sleep, sometimes hundreds of times. This means the brain -- and the rest of the body -- may not get enough oxygen. What does it mean when you stop breathing during sleep? It occurs when the soft tissue in the back of your throat relaxes during sleep and blocks the airway, often causing you to snore loudly. Central sleep apnea is a much less common type of sleep apnea that involves the central nervous system, occurring when the brain fails to signal the muscles that control breathing. Do you stop breathing when you sleep? 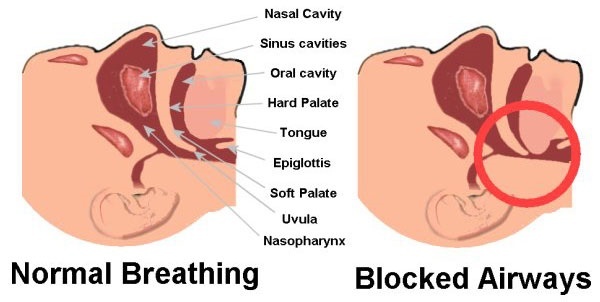 Apnea is the medical term used to describe slowed or stopped breathing. Apnea can affect people of all ages, and the cause depends on the type of apnea you have. Apnea usually occurs while you are sleeping. For this reason, it is called sleep apnea.